THE WAR THAT FORGED A NATION: WHY THE CIVIL WAR STILL MATTERS. James McPherson. Oxford University Press. Cover courtesy of Oxford University Press. The title of this book says it all: after a century and a half, the Civil War couldn’t be more compelling or more real to Americans. 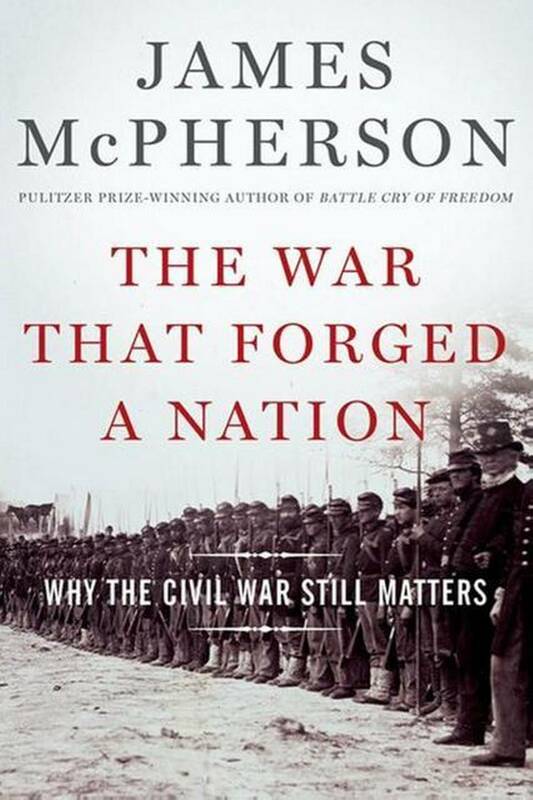 In The War That Forged A Nation, prize-winning historian James McPherson sets out to examine the reasons why the Civil War is so deeply interwoven with the collective conscience of America. And McPherson accomplishes his mission most brilliantly – isolating aspects of his own journey in 1960s Baltimore during the tumult of the civil rights movement and then using them as a foundational point from which to examine the core of the Civil War. In turn, the answer to why it all still matters today is revealed in the fact that the issues that pitted brother against brother in the 1860s are still very much at full-boil today. Even after more than 150 years, the racial divide still cuts an impossibly complicated chasm. Only now, it’s not just blacks who feel the whip. It’s Latinos. And Muslims. And Asians. And impoverished unemployed whites, too. Moreover, states across the landscape still seek the autonomy to control their own destinies. Stir in bigger-than-life personae like Abraham Lincoln and Robert E. Lee and it’s quite easy to see why the war between the states is as relevant today as it was in 1861. Nonetheless, this book isn’t just about yesterday. It’s about today, too: showing how the roads being traversed now were actually laid by the blood that was spilled on those home-grown battlefields not so long ago. This entry was posted on March 24, 2015 by Jacob Aiello in 2015, In the Spotlight, March 2015, Rat On Fiction & Nonfiction and tagged Book Review, Books.